slay verb (used with object), slew, slain, slay·ing. 1.to kill by violence. 2. to destroy; extinguish… A Slayer has but one purpose. 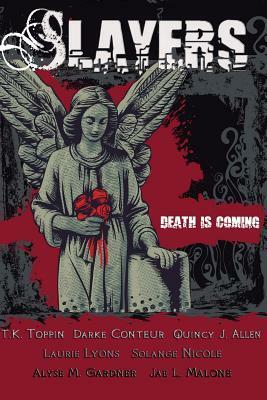 7DS Books debuts the newest collection of short stories in SLAYERS. Seven short story missions of your not so typical slayers taking on highly unusual targets. These captivating stories slice through tales of aliens, super slugs, demons, and beyond. Did that say super slugs? Yes. Read something dripping in fresh plots and bizarre characters. Discover your next favorite author with Slayers and 7DS Books. We Come in Peace is part of the anthology ‘Slayers’. It is told from the point of view of a Hlad – which appears from descriptions to be a beetle-like creature – called Raq. He is a Lieutenant, and is standing security for a welcoming party of dignitaries who have been sent to meet aliens who have crash landed on the Hlad planet. I felt that this was a very good short story. The perspective is interesting, and due to the alien-ness of the creatures who have crash-landed, nothing is given away until the end. A very well-crafted story indeed. This story is very different to other works by Toppin, and this is refreshing. Very well done indeed. Violence is depicted in this story, but is not as graphic as some I’ve read.